What do Facebook’s new Timeline and Open Graph really mean for brands? Brands always want to be where the consumers are. Consumers, for their part, seem willing to accept brands into their social online spaces. Indeed, they increasingly expect them to be there. Many brands recognise that their customers will will vent about them in public if they're unhappy, so customer service teams are using social media to pay active attention to their consumers, nipping problems in the bud and turning issues around as fast as possible in order to reduce complaints and traditional support calls. When consumers are also fans, they can help spread the word about your new product features among their friends. If people will talk about you anyway, it makes sense to be proactively involved in shaping those conversations, giving people something interesting to talk about and offering them something they'll find valuable in return for their attention. What people value varies, but it's probably more than just having somewhere to talk about you. They could do that anyway. Perhaps your fans are looking for coupons, or early access to news about new products. Perhaps you could even involve them in shaping future products. Just listening to their opinions and, importantly, showing that you're listening, is quite novel. Ten years ago you'd have killed for the opportunity to get such useful free insights. What's not valuable, and never has been, is collecting fans for the sake of it and then ignoring them. Understanding why your consumers are fans, and giving them something valuable, is an exciting chance to be closer to your consumers and build a useful relationship with them that recognises your role in their lives. Facebook's newly designed Timeline feature will get a lot of attention in the next few days as people get used to a new design. Personally, as a user, I think it's great. The ability to quickly and easily browse through the stream into the distant past means I can now easily navigate back to what I was doing 6 years ago. Nostalgia, here we come. But despite being the most visible difference, the new Timeline is actually the least interesting of Facebook's recent changes. There's a lot more happening below the surface. The new Open Graph changes are significant, and worth taking some time to understand. Facebook's 'social graph' model is made up of the interconnections between people, and the other things those people care about. Previously, this was managed entirely by Facebook. 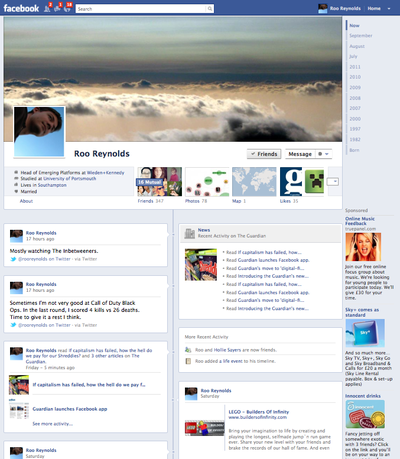 For example, you could add (and 'like' and comment on) photos and other content, and you could 'like' Facebook pages. In 2010, that model was extended into what they called the Open Graph, which allowed web pages outside Facebook to similarly be liked and connected to the social graph; i.e. shared with friends. The recent changes take this a lot further, allowing developers to integrate any arbitrary objects and actions from 3rd party apps. The first to get involved have been media organisations, allowing their content to be read in new Facebook apps which, in turn, publish details about what the users are consuming using Open Graph, helping it spread to their friends via the News Feed (showing users the most relevant updates) and the new Ticker (showing the most recent updates, in real-time). In fact, the possibilities for Open Graph are now endless. Made a recipe from a supermarket's online recipe site? With a relatively straightforward bit of Facebook integration, that site could be telling all your Facebook friends what you've cooked. Ordered a takeaway to be delivered to your door? That's an activity that could be published into your individual Facebook Timeline, and of course to your friends' News Feeds and real time Tickers. The most controversial recent change is the notion of "frictionless sharing". Once you've allowed an app to publish your activity, don't expect it to keep asking you that each activity is really something you want to share. Everything you do in the app will be silently added to your timeline and the real-time Ticker. It's controversial. Is "frictionless sharing" killing taste? Will it mean the end of guilty pleasures? Are new apps too spammy? Are even more fine-grained controls needed to give users the choices they want? The debate will continue to rage. It remains to be seen whether Facebook's attempt at "frictionless sharing" will be successful. Certainly, bypassing manual and intentional choice seems to water down the value of sharing something. It also dilutes the benefit of the new Ticker, with the real-time feed prone to being flooded by automatic updates from noisy apps. These could prove unwelcome and unpopular. "Zuckerberg's law", that each year people will be sharing twice as much as they did the year before, represents an ambitious desire to shift public behaviour; Facebook is at the forefront of an ongoing experiment in testing and exploring public expectations around privacy. These recent changes represent a potential risk for brands wanting to be involved with the cutting edge social sharing features of Facebook. Being seen to encourage users to automatically and passively share information in a new breed of Facebook enabled apps (I read this, I listened to that, I did the other…), of which they would previously have chosen to share a limited subset manually, is big step and not one to be taken lightly for any brand. New apps will need to make it clear exactly what will be shared, with whom, and when, and how to opt out. Facebook wants more real-world things (movies, sports teams, celebrities, restaurants and, well, everything) to be represented in Facebook. No surprise there. There are two questions brands and agencies should be asking themselves before making a Facebook app though. First, are you comfortable sharing your company's data? (I'd say the old cliche "if you're not paying for it, you're not the customer, you're the product" goes for marketers as well as users.) And second, will consumers actually find value in interacting with you, and do they already have a relationship with you? With increasing amounts of content on Facebook, brands wanting to compete for attention will have a tough job and need to focus on being relevant and interesting as they attempt to cut through the 'clutter'. That clutter is also known as the social lives of their consumers, so let's not dismiss it. We should look for ways to creatively involve ourselves in their lives, in ways they cherish. The recent changes to Facebook represent more than just a way to better target your ads and Sponsored Stories. We have an opportunity to make it easier for users to share updates about their relationship with your brand, as part of the ongoing story of their lives they share with their friends. But if you're not already part of their lives then a Facebook app is probably not the way you're going to win them round. 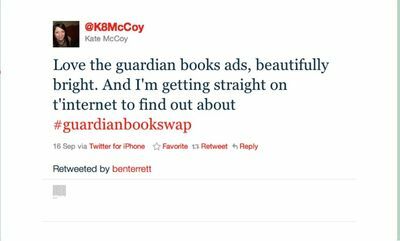 Author Wieden Kennedy LondonPosted on September 30, 2011 March 31, 2016 Categories ad industry, how we think, stuff5 Comments on What do Facebook’s new Timeline and Open Graph really mean for brands? Thirsty? Then turn on the engine. 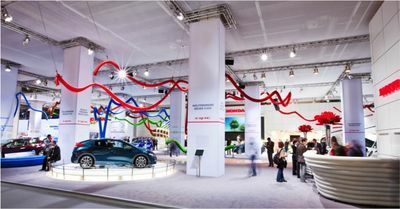 As previously blogged, we worked with Honda on their stand for the Frankfurt Motorshow. 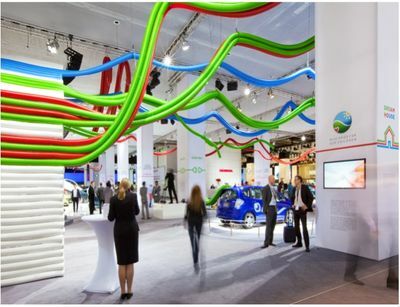 Here's a nice little detail from the stand we didn't share before: the paper water cup we designed for stand visitors. 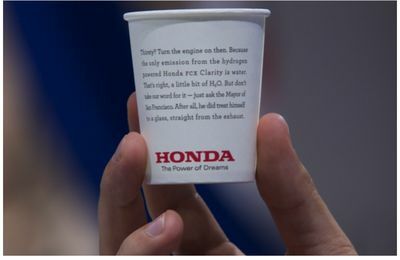 The copy explains how the only output from the exhaust of the hydrogen-powered Honda FCX Clarity is drinkable water. 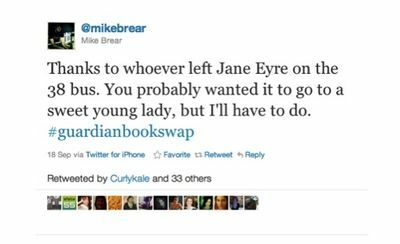 Author Wieden Kennedy LondonPosted on September 29, 2011 March 31, 2016 Categories hondaLeave a comment on Thirsty? Then turn on the engine. 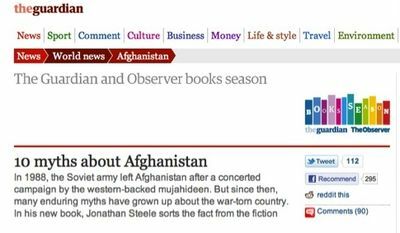 A few images from our campaign with The Guardian & The Observer for their Books Season. 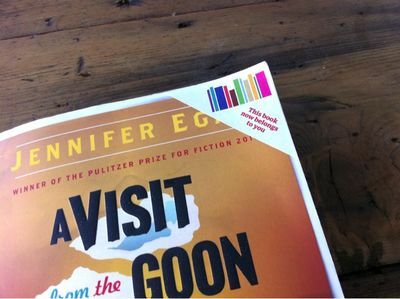 Part of the season is the Book Swap initiative, which encourages people to leave recommended books for others to find, using these stickers. 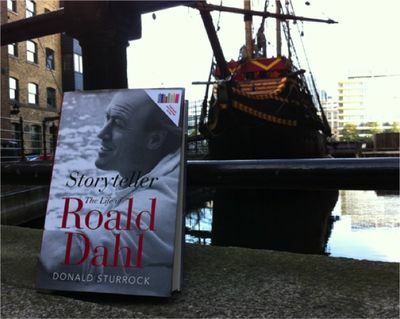 Ben T left Roald Dahl's autobiography for someone to find, apparently somewhere in the seafaring 16th century. 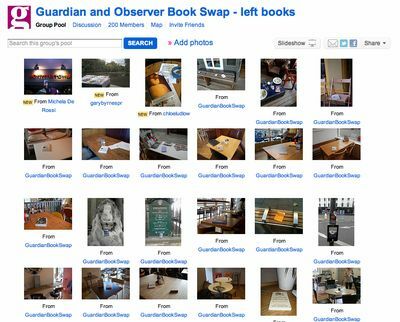 Many others left books and posted pics on Flickr to help others find them. Wish I'd been in a position to find this one. 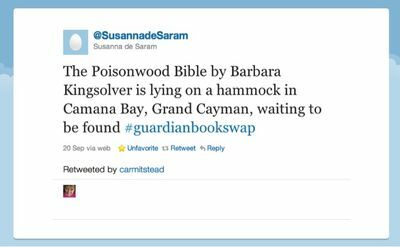 A hammock on Grand Cayman with a copy of (the rather excellent) Poisonwood Bible, just waiting for someone. Nice. 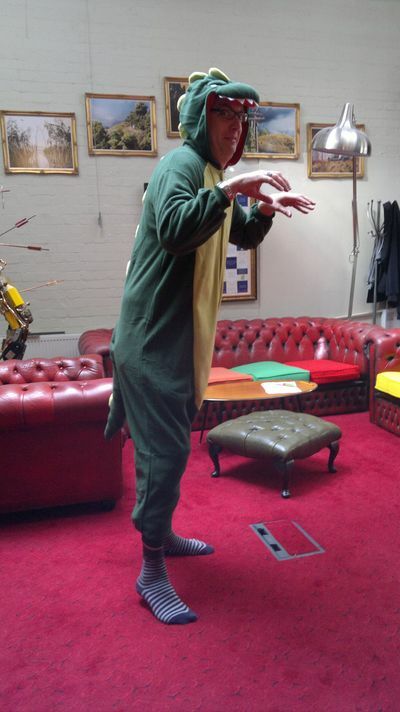 In the basement, this morning. 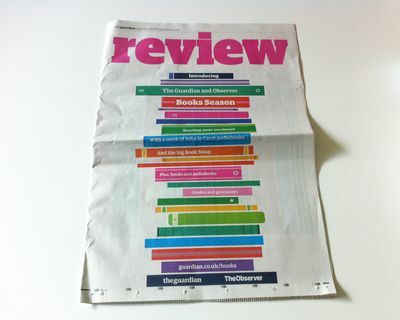 Last weekend the Guardian and Observer launched their book season with a campaign created by us. 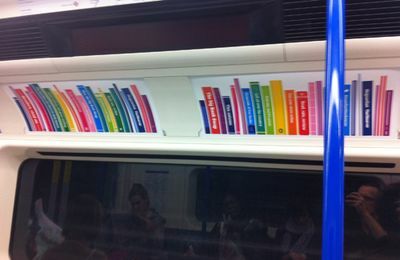 And it's just everywhere…. 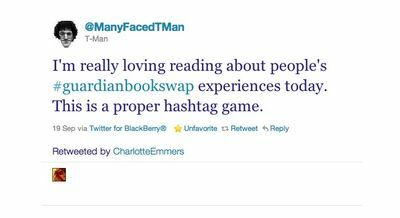 The books don't bend, obviously, it's the panels that do. It's also on the radio with Bill Nighy and in the paper with many brilliant promotions. 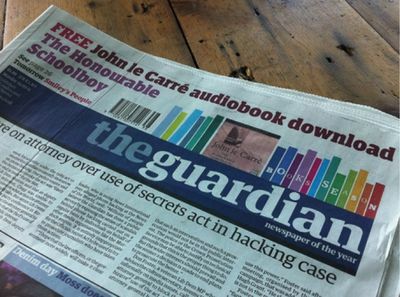 This week: a free John leCarre audio download every day, the demand for which gave AudioGo's server a little bit of exercise. Next week: CDs of all your favourite childhood stories and a celebration of Dickens' bicentenary; a bit of advertising for free there. 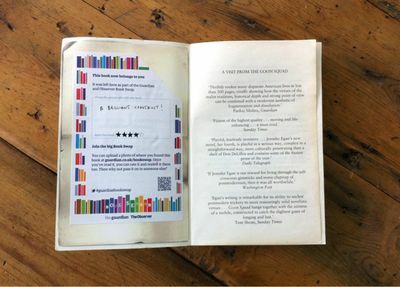 At the heart of the season is the big Book Swap in which 15,000 books have been released around the country for people to find, read, review and share again. 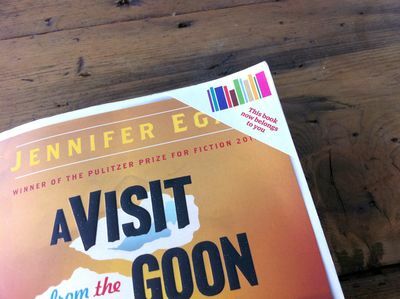 We produced some bookplate stickers to stick in the participating books. If you didn't get yours in the paper you can download one from the website. And finally, it's even been reported on Russian news. Lots more to come. Buy the Guardian and Observer this weekend (obviously) and for the next few weeks to find out what. 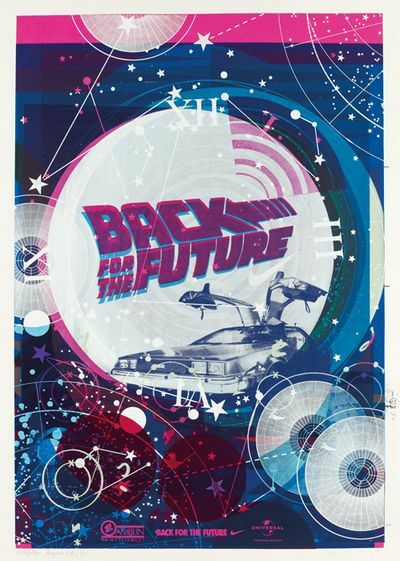 Some more info, via cool-hunting site If It’s Hip, It’s Here, on Wieden + Kennedy Portland’s ‘Back for the Future’ campaign with Nike for the Michael J. Fox Foundation for Parkinson’s Research. 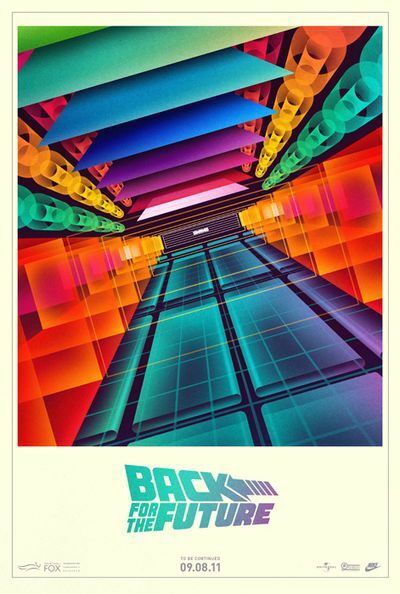 Some more info, via cool-hunting site If It's Hip, It's Here, on Wieden + Kennedy Portland's 'Back for the Future' campaign with Nike for the Michael J. Fox Parkinson's Disease Foundation, as previously blogged about here. To raise funds for Michael J. 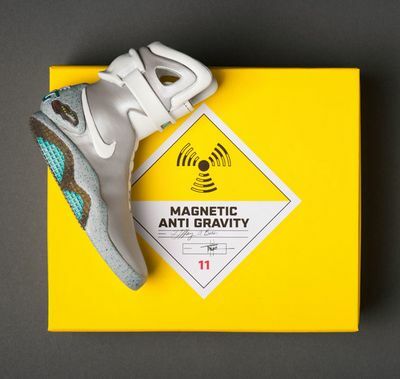 Fox's Foundation for Parkinson's Research, Nike designed 1500 pairs of shoes based on the kicks worn by Fox's character Marty McFly in the original movie, "Back To The Future" to be auctioned off on eBay and at select Niketown stores. 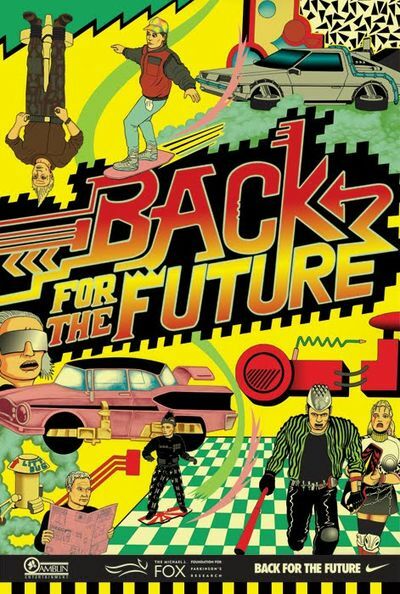 All of the shoes have now been auctioned off, but the two minute film featuring Bill Hader with Christopher Lloyd reprising his role as Dr. Emmett Brown is currently top of the viral charts, with nearly five million views so far. 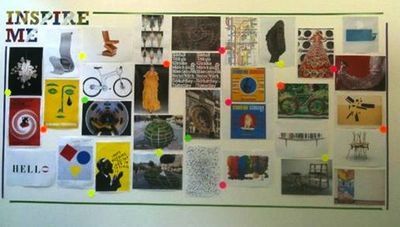 I love these poster designs for the auction event, by Kate Gibb, Brent Rollins, La Boca and Will Sweeney. Here's that short film again. And here's a message from Michael J. Fox. 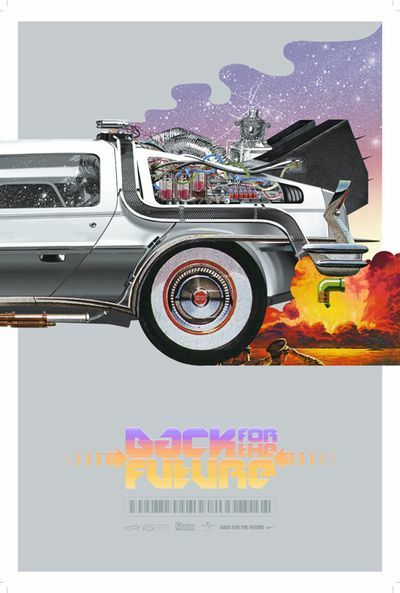 Author Wieden Kennedy LondonPosted on September 23, 2011 March 31, 2016 Categories nike, the workTags Back, Foundation, Fox, Future, kennedy, Michael, Nike, Parkinson's, Research, wieden2 Comments on flux capacitor…fluxing! 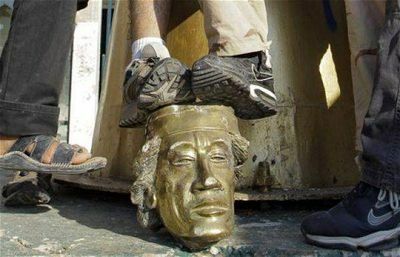 Happened to notice the swooshes on the feet in this image from the Libyan revolution. 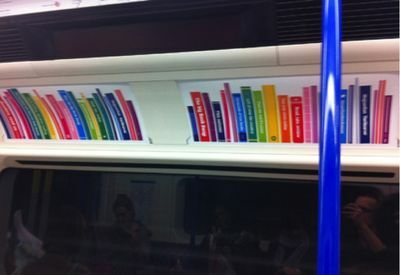 Bit too late now for a tactical ad. 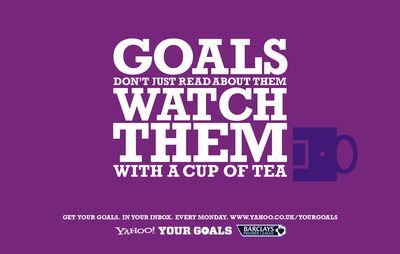 Free Premier League Highlights With Yahoo! Not many people out there know that Yahoo! has the Premier League highlights available for everyone, for free! 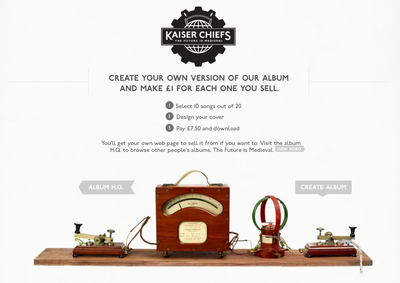 However, we tried to change that with a slight twist on their current available product. Rather than try and create a traditional campaign to drive people to the video hub, we decided to send the content straight to the fans: YAHOO! YOUR GOALS was created. 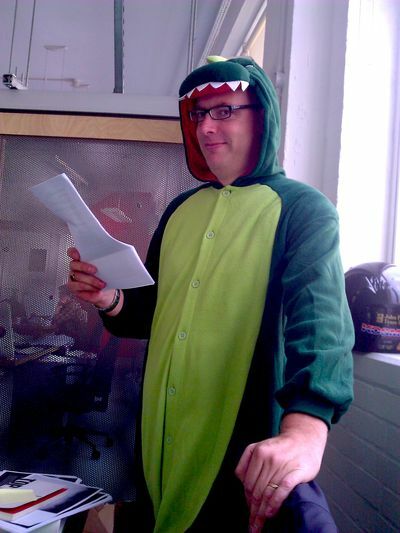 So now I can sign up for a weekly personalised update for my chosen team. Throughout the season when I wake up on Monday mornings, my team email is waiting for me in my inbox with all the highlights and news – brilliant. Never again will I have to trawl the internet for a dodgy link at work on Mondays to send 'that goal' to my mates, or just to catch up. 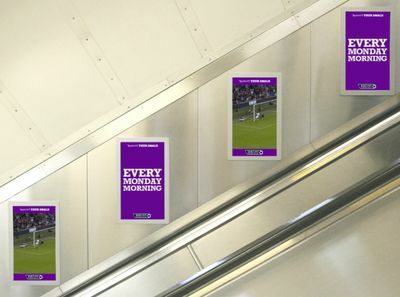 Not only did we send the emails out on Monday mornings when the banter is flowing, we also took over other various media including Metro press ads, online homepage takeover and underground stations throughout London. You now have no reason at all to miss a match. Author Wieden Kennedy LondonPosted on September 22, 2011 March 31, 2016 Categories UncategorizedLeave a comment on Free Premier League Highlights With Yahoo!